From breathtaking, thought-provoking exhibitions to public programs and community partnerships that amplify and deepen visitors’ experiences with art, the 2016 fiscal year was a success by all accounts. This past year the Museum presented more than 30 exhibitions and 630 films that that celebrated the École des Beaux-Arts, showcased some of the finest landscape paintings in the history of art from the renowned collection of Paul Allen, reflected on the legacy of legendary photographer Edward Curtis, discovered Native fashion, and traveled the Northwest and the globe through film. Last year the Museum connected more people to art and film than ever before through education and public programs. 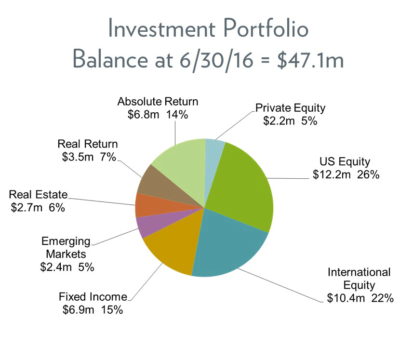 More than 45,000 individuals participated in public programs and tours, including nearly 25,000 students. Additionally the Northwest Film Center hosted more than 200 visiting artists and welcomed more than 3,000 high school students to free Global Classroom screenings. Community partnerships brought fresh perspectives and vital context to exhibitions and installations, while also welcoming new audiences. These included partnering with Portland’s blind and low vision community and neuroscience experts at OHSU for Seeing Nature; the Native American Youth and Family Center during Contemporary Native Photographers and the Edward Curtis Legacy, and Nike N7 to host Native artist Bunky Echo-Hawk during Native Fashion Now. A nationally unique partnership was formed last year when the Museum hosted Literary Arts’ reimagined Wordstock festival. In one day the Museum welcomed 8,000 people—transforming the ballrooms and galleries into a celebration of the written word. The Museum continued to work closely with school districts and educators throughout the city and the region. In addition to providing professional development for 490 teachers, the Museum hosted The Heart of Portland, a Portland Public Schools K-12 arts showcase. Thanks to funding from the PGE Foundation, the Classroom Poster Project became a reality during the last school year, with more than 130 schools receiving posters featuring works from the permanent collection. The Museum’s curatorial and collections department saw growth and innovation in 2016. The Arlene and Harold Schnitzer Curator of Northwest Art, Bonnie Laing-Malcolmson, retired after six years of dedicated service; the online collections and library teams merged; and a number of important works were added to the collection, including three contemporary photographs by Brazilian Vik Muniz, a dramatic dress from Wendy Red Star, an iconic Cézanne lithograph, and a photograph by distinguished photographer Emmet Gowin. Growth in Online Collections continued, with usage increasing by 30 percent over the previous year. Other notable milestones include the cataloguing of the entire Northwest Art collection and the inclusion of the collections in national scholarly databases. 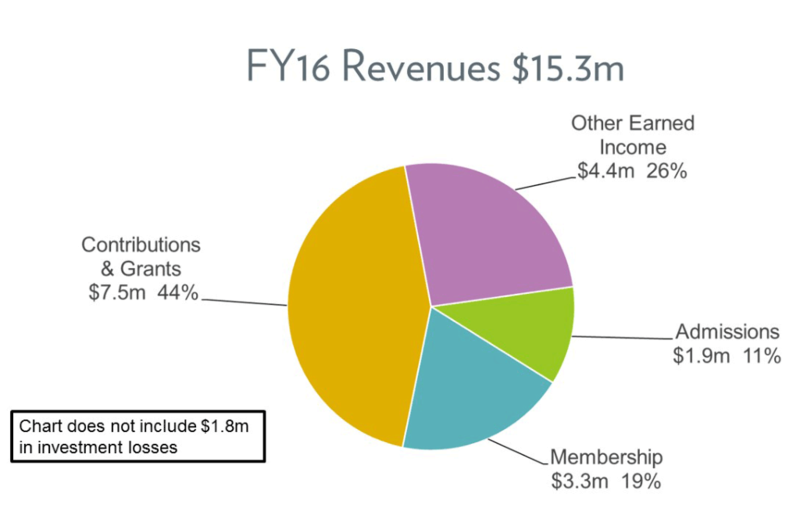 For the fifth year in a row, the Museum ended the year with a balanced budget, an important indicator of sound financial management that is key to attracting support from foundations and government. 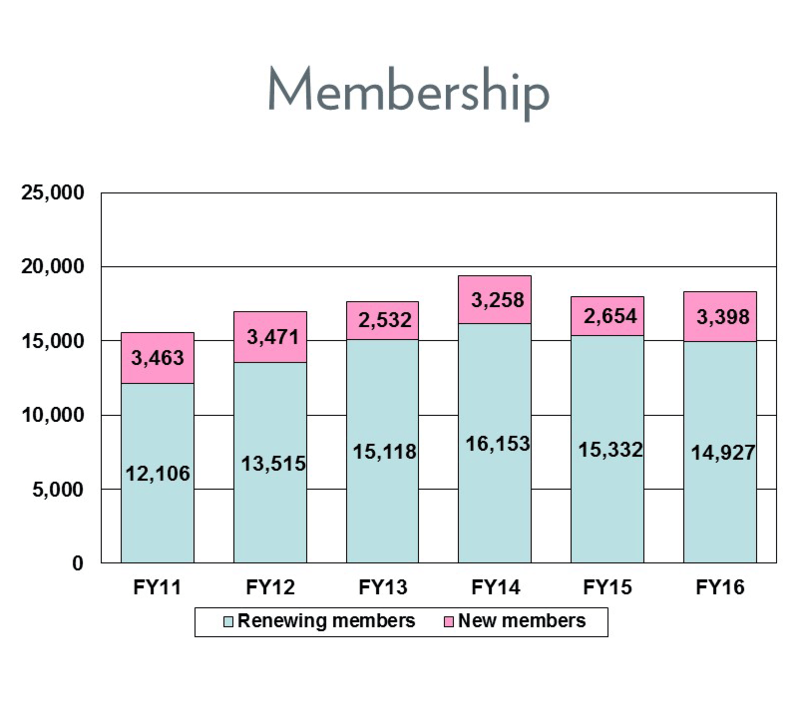 Additional highlights include an 8 percent increase in membership and donations, as well as record levels of earned income from admissions, store sales and rental income. 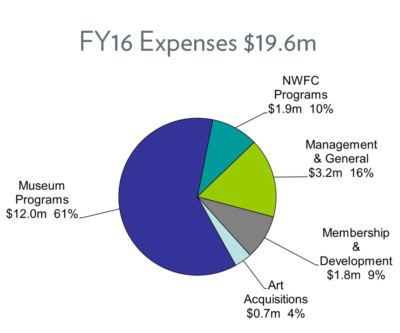 Funding to support the Museum comes from a variety of revenue sources. 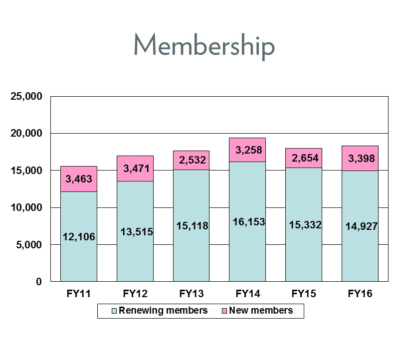 Last year, 29 percent came from admissions and memberships, 44 percent from contributions and grants, and 26 percent from Museum Store sales and facility rental fees. The majority of expenses were used in support of Museum and Film Center programs and to acquire and preserve art. 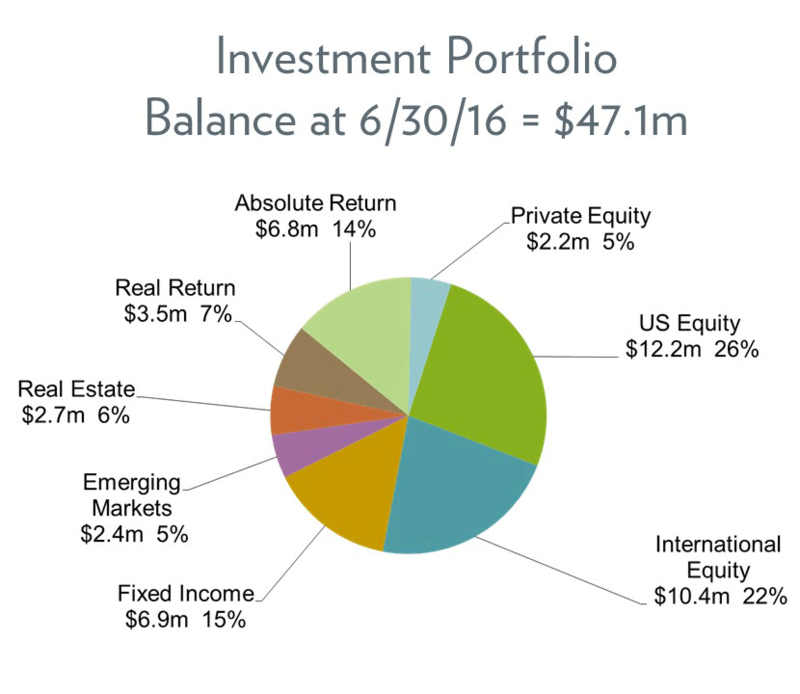 The Museum’s audited financial reports and 990 tax returns are available here. 325,000 people visited and participated in Museum and Film Center programs, with nearly one-third of those attending for free or at a reduced price, including nearly 50,000 children. Nearly 25,000 people participated in 108 public programs, including lectures, artist talks, and in-gallery events. More than 490 teachers attended educator-specific events throughout the year. Over 1,000 Museum and Film Center volunteers gave more than 70,000 hours of their time. Over 3,000 high school students attended free Northwest Film Center Global Classroom screenings, and more than 1,000 students of all ages attended classes at the Northwest Film Center.